Do Global Positioning Systems Have A Future In Sport? This post will give a detailed account of what GPS is, what it is used for along with its advantages and disadvantages within sport. First of all, GPS is the abbreviation given to the Global Positioning System that is now widely used in the area of sports coaching and performance (Garmin, 2014). – Data Loggers, these are of the most use to sports analysis as they record data on an internal memory which can be later uploaded to a computer for further analysis of performance. Data loggers are also used in mobile phones to geo-tag any photographs that are taken. – Data Pushers, these are tracking devices that are commonly used to identify location, moving speed and direction. They send signals at quite regular intervals and are commonly used today by taxi companies to check the location and speeds of their drivers at any given time. – Data Pullers, these are simply small devices that are continuously working and can be accessed when required. These are commonly used in situations where tracking a stolen object is required. So what is GPS used for in sport and what information does it give us? Basic GPS devices are used to record data that measures an athlete’s movement patterns, position and velocity in field sports (Cummins et al, 2013). This data will include speed, average speed, elevation gain, elevation loss, movement direction and even force of impact in sports such as Rugby League. GPS devices are currently being manufactured with a 1-Hz, 5-Hz and 10-Hz sampling rate (Cummins et al, 2013). This simply refers to how many times per second information is received, so for example a device with 5-Hz will gather information five times per second. All the literature surrounding this study suggests that the greater the Hz sampling rate, the more accurate the data will be (Jennings et al, 2010). Firstly of all you will notice on the map the green arrow signalling the start and the red line showing the route taken during this session. On the left hand side you can see the type of data that is recorded throughout; Distance, Time, Average Speed, Elevation Gain, Calorie Expenditure and Average Temperature. These areas are then further broken down below this to provide more information. This information is put into charts down the right hand side of the page which makes the data very easy to analyse. For example, as you can see here; as the elevation increases, the speed decreases whilst the heart rate increases. This information, alongside the decrease in cadence at the same point shows that the athlete was working harder as he went up the climb. 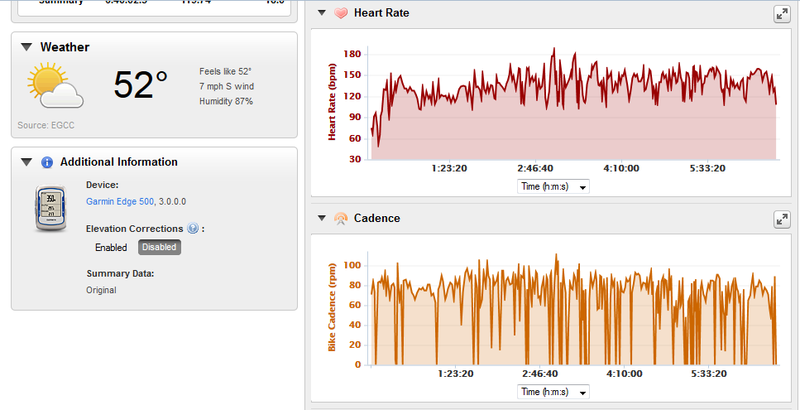 Additionally, you can see that the athlete’s heart rate peaked at 185bpm after 3:05:09 of riding. When this is compared to the elevation it becomes clear that there is a short steep uphill section after a small dip which led the athlete to accelerate over the climb quickly, hence the sharp increase in heart rate. GPS devices are currently relatively cheap for the amount of information they provide, for example a Garmin cycle computer costs anything between £200 and £800. This is an advantage as it means that GPS data is available to the masses. Another advantage is that the data is easy to analyse and the above data is proof that training can easily be tailored to the needs of the individual (Reid et al, 2013). For example, if a cyclist takes a long time to recover from a hard effort then the coach can provide the athlete with threshold training to improve this area. This also proves that there are no ‘hiding places’ when it comes to training or racing as all the data will show the true performance and provide information to deem whether the session was optimal or not. The disadvantages of using GPS are very few and far between! One issue is that an athlete provides his/her coach with all the data from a specific session, yet without the relevant information about the actual performance the data becomes very speculative and requires the coach to make assumptions about what actually occurred. For example, if there was a large increase in heart rate data early on in a cycle race the coach could assume that the athlete is working too hard at that given point and thus alter their training around this. Yet in reality the athlete may have had a puncture and had to chase back to the bunch. This is significant as it suggests that without the specific knowledge of the performance, the data can become useless. This is easily solved with the use of video footage to support that data. “The next revolution is to make it all possible indoors and under stadium roofs, and with the new CSIRO indoor tracking system the future is already upon us” and there is further information on this area within their blog. GPS in sport is an area that is constantly being further developed and seems to have firmly planted itself in the future of not only elite sport, but also amateur sport. The developments of GPS will involve increased battery life for longer events, smaller unit sizes, more HZ per second and the integration of more inertial sensor data to provide more information (Aughey, 2011). My personal view of the use of GPS is that they provide a wealth of information that as a coach is extremely useful in analysing an athlete’s performance and allow training to be easily tailored to their needs. Aughey, R.J. (2011) ‘Applications of GPS Technologies to Field Sports’ International Journal of Sports Physiology and Performance’ 6 (1) pp. 295-310. Catapult. (2014) ‘Indoor GPS’ For the Lions, GPS Plays Important Role in Preventing Injury As Well As Helping with Players Rehabilitation. Available: http://www.catapultsports.com/category/indoor-gps/. Last accessed 29/01/14. Cummins, C., Orr, R., O’Connor, H. & West, C. (2013) ‘Global Positioning Systems (GPS) and Microtechnology Sensors in Team Sports: A Systematic Review’ Sports Medicine. 43 (1) pp. 1025-1042. Garmin (2014) What Is GPS?. Available: http://www8.garmin.com/aboutGPS/. Last accessed 29/01/14. Jennings, D., Cormack, S. & Coutts, A.J. (2010) ‘The validity and reliability of GPS units for measuring distance in team sport specific running patterns’ International Journal Sports Physiology Performance. 5 (3) pp. 328-341. Kurzawa, D.A. (2008) GPS in Sport: Analysis and Determination of Fitness Levels. Final Year Thesis. University of New South Wales. Reid, L.C., Cowman, J.R., Green, B.S. & Coughlan, G.F. (2013) ‘Return to Play in Elite Rugby Union: Application of Global Positioning System Technology in Return-to-Running Programs’ Journal of Sport Rehabilitation. 22 (1) pp. 122-129. 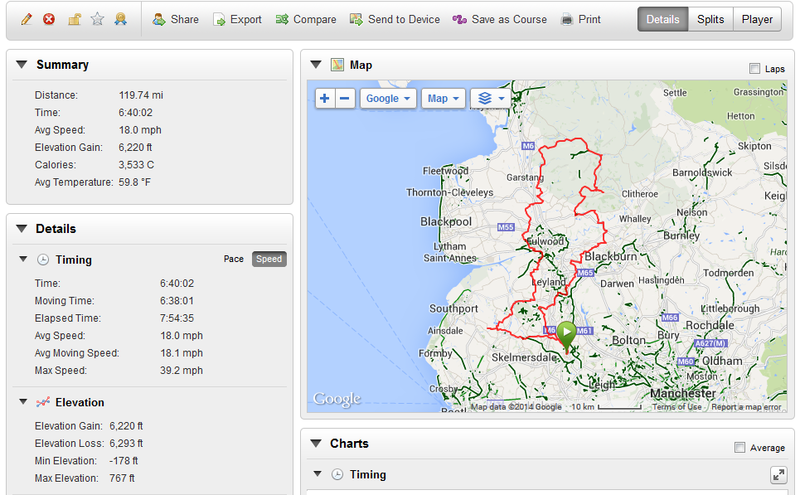 This entry was tagged Cycling, Endurance, GPS, Sport. Bookmark the permalink. Mike, this is a great read and even without a cycling background it got me hooked. It’s informative about the development of GPS but has some really good anecdotal and personal touches. Could you embed some links to other sites, blogs or info from here too? Great job! !